Tag Bertuzzi was starting to wonder if it would ever happen. The second overall pick in the Ontario Hockey League draft had gone scoreless in his first 12 games. There were chances, plenty of them, but the puck just wouldn’t go in. 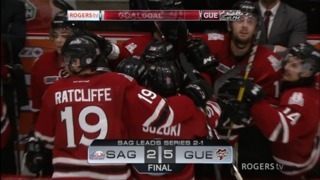 Finally, with two seconds left in the second period Friday night at the Sleeman Centre, it happened. 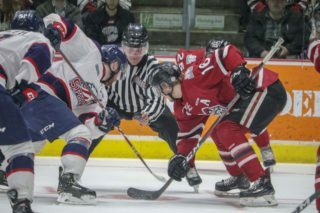 Bertuzzi’s wrist shot from the faceoff circle beat Erie Otters goaltender Troy Timpano, sending his teammates into a wild celebration and putting a beaming smile on the third Bertuzzi to score in a Storm uniform, following dad Todd and cousin Tyler. 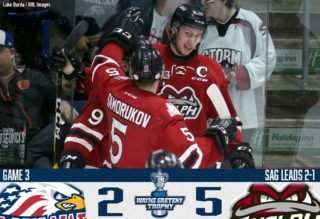 The Storm would go on to win the game 5-4 in overtime, with Cedric Ralph’s second goal of the game, 20 seconds into overtime, winning it. “It’s fun to get the first one. 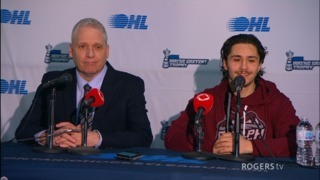 It’s a really good feeling to get your first OHL goal,” said Bertuzzi. He was robbed earlier in the game on a wraparound, but was robbed by Timpano. Unfortunately his dad Todd, who makes most home and away games, wasn’t at this one. He was in Texas. “Hopefully with that goal comes more confidence and more points,” Bertuzzi said. His goal put the Storm up 4-3 at the time. 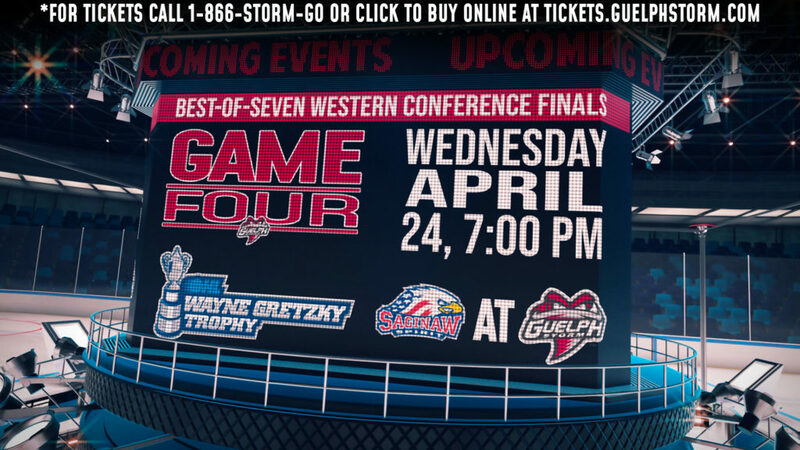 But Storm defenceman Ryan Merkley put the puck over the glass with 1:54 left in regulation and the Otters, with the goalie on the bench to give them a two-man advantage, tied the game with 13.4 seconds left on the clock. That set up Ralph’s heroics. With Storm defenceman Garrett McFadden holding the puck in the corner, Ralph snuck behind his check and redirected a perfect feed from McFadden for his 11th goal of the season.